Americans: Bet the golf at Bovada and get $250 in free bets. More details. Well I hope everyone enjoyed the U.S. Open, especially my correctly predicting the winner! I’ll probably be more conservative this week. I find when you have a big win it’s easy to jump on the next week full of confidence. That’s something I have did many times before and while sometimes it’s worked out, I’d rather play it slow and safe. So we’ll go with small unit bets this weke. 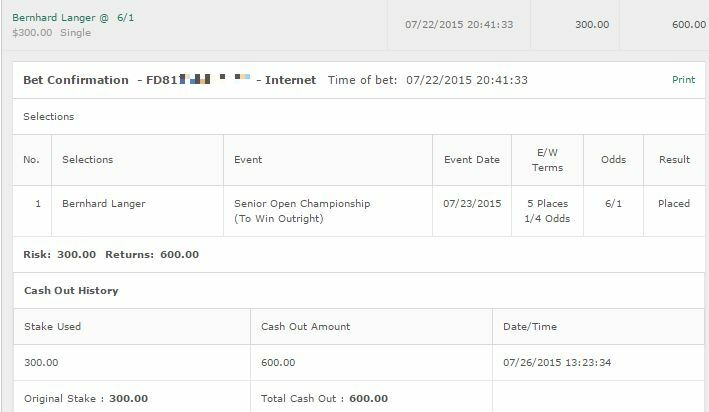 Thank you Dustin Johnson – and boy, do you ever deserve it. My first bet is a quarter unit bet on Shawn Stefani 75/1. The last tournament Stefani played in was the FedEx St. Jude Classic and he had quite the time going 65-71-73-65. Stefani is one of those golfers who rarely retains his form throughout a tournament. He can have an amazing round followed by an insanely poor one. It can be frustrating from a betting perspective. But I did like what I saw from him at the St. Jude Classic, and he got a 2nd place here a couple of years ago. So I’m feeling okay with a small bet on him here. I’m also going to throw a quarter unit on Marc Leishman 25/1. It feels like he is treading water recently but I’ve liked some of his performances here in the past and I have to wonder if he is going to come out here with something to prove. He was looking solid at the US Open then had a disastrous 3rd round – have to wonder if he is going to come out to this one just pissed off and ready to dominate. That’s all I got for the Quicken Loans. Both are to win & E/W. Quite a tricky one this – I could easily see Willett or Stenson taking it down. I’m a bit concerned about Stenson though and his withdrawal from the US Open. Willett too I haven’t been convinced with his form lately despite some good performances. I’m going to go with a quarter unit on Thomas Bjorn 100/1 based purely on his form on this course before. It seems to suit him and even though he’s on a downswign on form at the moment he’s proven capable here before. Two other bets are Fabrizio Zanotti and Pablo Larrazabal. Both of them have stuck out to me when running the numbers to the point that at their prices I have to include them. Quarter units on both, and all three are to win & E/W. Also just a random gut play on Tjaart van der Walt but I feel I am burning money there so I wouldn’t really recommend that one. Just someone that I saw earlier and then placing my bets his name popped up and I was like “Ah gotta take it”. Special Note to Americans: The majority of my bets rely on each-way betting which is an insurance bet on the golfer to place in the top 5. Unfortunately no American sportsbooks offer that option. I recommend betting at Bovada where you can choose to bet "To Win" and also "Top 5". Split your bet over both of those. Plus get $250 in Free Bets - Only available at Bovada. All of our golf betting tips are free, and we can send them free via e-mail to you as well. Then you don't have to keep checking our site - just get an e-mail with the latest golf tips to your inbox! 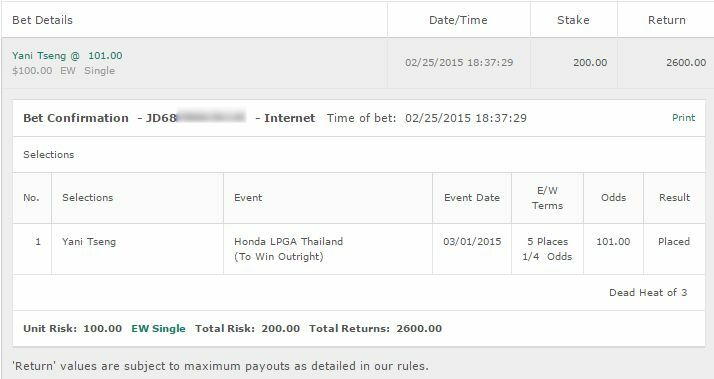 You can see our full record in our Golf Betting Tips Hall of Fame. Ie cover the PGA, LPGA, European and Champions Tours. I use various computer simulations as well as my own instincts to find up to 6 potential winners at each tournament at great betting odds. 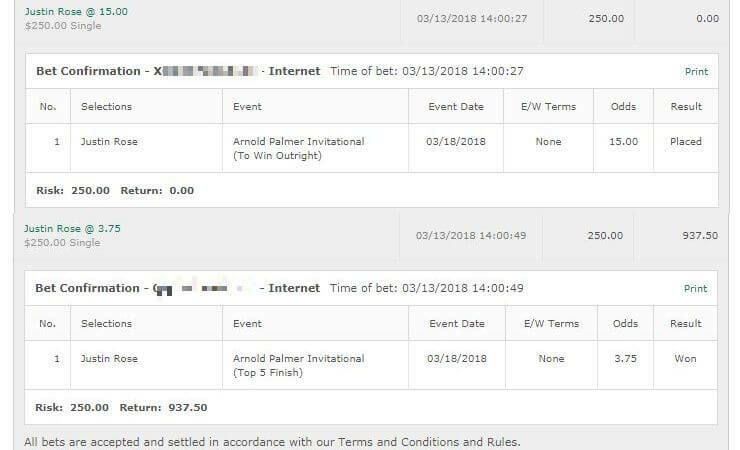 All you have to do is bet the golfers I recommend, either to win, or each way bet meaning you win cash if they end up in the top 5 in that tournament. There are no guarantees with my tips which is why it's called gambling. If you are concerned about your gambling, visit GambleAware.org. You must be at least 18+ to gamble.